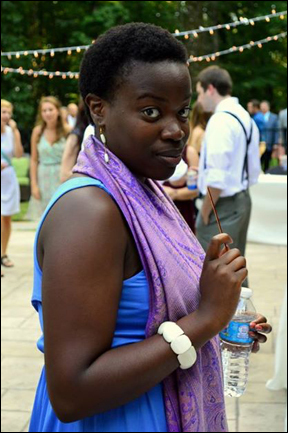 "I am a vivacious, young, beautiful, African-American woman....it's true, I'm all those things!!" Laura's parents, who immigrated from Burundi, Africa, were people of faith who encouraged her to recognize that valuing the love of God was more important than identifying with a denomination. However as a young person, she connected with a United Methodist Church community and found it to be a place that she felt truly represented the love of Christ. "I'll never forget my first youth pastor, Jason Morris, who pulled me aside at age 12 and told me 'I think you're going to be a leader one day,'" she remembers. "He led me into acknowledging that I am called to be a leader specifically in the capacity of the church. I'll never forget the opportunities and blessings that he placed into my life by walking with me and loving me." Encouragement from her father and brother particularly guided her heart towards issues of justice, and her youth leader, Kris Konsowitz, challenged her to learn more about the United Methodist Church on the global level. When we met Laura as a Young Adult Representative on the 2013 Young People in Mission Design Team, it was clear that our internship program would be the perfect match to help her develop the strengths, passions and interests she so obviously already possessed. "When I think about justice, I think about love, and you can't really separate the two." When the Design Team met earlier this year, they determined that "justice" would be the heart and soul of the event. The passions and personal experiences she brought to the table helped shape and mold the week at Lake Junaluksa into a time of educating and equipping this next generation of justice-seekers. She was also was able to mentor the younger members of the Design Team, and encourage them that by serving in this capacity and sharing their passion with their peers, they were showing love and justice in their own way. "When we were at Young People in Mission...that is what justice truly boiled down to. It was loving one another in a way we knew we could." "How do you participate in a church that is completely untraditional, in a community where anything is expected? You accept THIS is church." As part of her domestic placement, she worked with Community Church Without Walls, a United Methodist congregation that was created to be for and among the poor of urban Birmingham. Rev. R.G. Lyons, the founding pastor of the church, served as her mentor for the summer. She describes him as someone who "seeks justice for all," and one of the most important things she observed from him was how to make the Gospel translatable to everyone, to people who are in the margins not only physically, but also spiritually. Laura has a tendency to make friends and build relationships wherever she goes, and her weeks in the West End of Birmingham were certainly no exception. She spent her time at CCWW and its umbrella organization, Urban Ministry, connecting with the people who serve and are served there. Talking to them, understanding them, fellowshipping with them, being among them. Loving them. She was also able to go to community and church development meetings, participate in their trips to SIFAT, Serve Week* and Camp Lee**, engage in weekly Bible studies, and she even had the opportunity to preach one Sunday morning. Her intentionality and willingness to learn made her time in urban Birmingham an eye-opening, positive experience that helped guide her as a leader at Young People in Mission, but also prepared for her for the time she'd soon be spending in the Philippines. *Serve week, a week of service where FUMC downtown and CWW, combines youth groups and together participates in serving the Birmingham community by painting housing, building friendships at Church of the Reconciler, and reflecting in group discussion of what it means to serve in our community and world. **Camp Lee, in Anniston Alabama, was the last camp of the Summer. CWW and FUMC Downtown joined together for the last summer retreat, to play, fellowship,have awesome dance parties and discuss how theologian and pastor John Wesley's three rules of do discuss John's Rules of Do No Harm, Do Good, and Stay in love with God, and how to apply them in the upcoming school year. "Young people in our church care so much about the issues of the environment, of inclusivity, of what's going on in Israel-Palestine, of divestments of being a Church who really speaks truth to power, who does walk the walk and actually talk the talk, and we weren't just glossing over with 'God loves you,' but we wanted to put that love into action. And we did that at Legislative Assembly." Laura was selected by the Jurisdiction to be a voting delegate to the Global Young People's Convocation and Legislative Assembly in Tagaytay, Philippines, and her time there served as her international placement. One of her main goals this summer was to understand and see the significance of the United Methodist connectional system. With 140 delegates from 30 countries and representatives from many of the United Methodist Boards and Agencies, she was given an incredible opportunity to see and understand our connectional system at work. Laura knew that her summer would present her with challenges and a fair share of realities to process, but she was not expecting to arrive at the Convocation at the exact same time as Typhoon Rammasun. Laura and the other delegates spent much of their time dealing with the effects and aftermath of this natural disaster. Watching locals pick up the pieces of what was left of their homes while never losing the hospitality they showed the Convocation participants had a profound impact on her. There is a rawness of being in a developing country during such an event. It was an experience that she recounts with tears, and there is no doubt she left a part of her in the Philippines. If you were to ask her where she would go if she could be any place in the world right now, without any hesitation this country in Southeast Asia would be her first and only choice. One particular day on the Convocation, before convening to discuss legislation, she had the opportunity to pray over the Assembly. Her prayer was translated into 5 language, and she able to "hear what grace and love sounded like" in French, German, Spanish, Portuguese and Russian. "I can't replicate that," she recalls. "It was a one time experience. For me to have that opportunity was pretty unique." "To be willing to love and act on that willingness by engaging in loving every person in every moment is an act of justice. It is an action that at its root mirrors the compassion that Jesus had for every person he came across, from the righteous to the wicked. Jesus had compassion and that compassion compelled him to act in both love and justice," she reflects. "I've been really encouraged to have my summer begin with those words from my mentor and end in my own self-reflection of 'this is what it means to do justice.' To be able to step into this internship and see justice in every way...has been an amazing opportunity and I'm truly thankful, and I can't wait to start my last year of seminary with this in mind." This is just a snippet of Laura’s experience this summer, but there is so much more. Take a few minutes to watch this video below to hear about Laura's summer in her own words. Want to stay up to date on what's happening at UMVIM, SEJ? Sign up for our weekly newsletter that is full of important information, such as openings for mission opportunities, team leader training sessions, exciting events and other happenings. 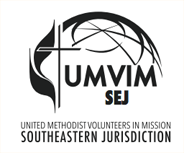 By donating to UMVIM, SEJ, you help us continue our mission to show Christian Love in Action around the world.